Homemade blackberry peach pie. 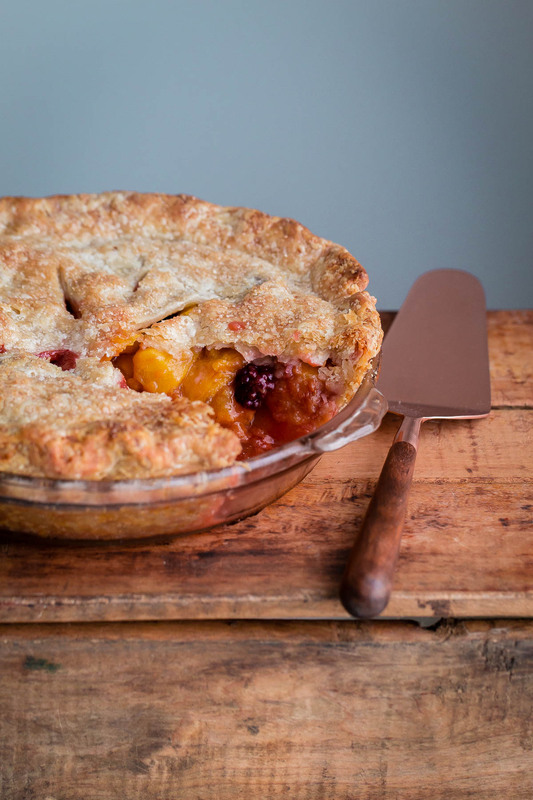 An incredibly flaky all-butter pie crust filled with ripe summer peaches and tart blackberries! Today’s blackberry peach pie provided me with a very important life lesson: make more homemade pie! If there was ever a time to get over a fear of pie-making (and more importantly, homemade pie crust! ), let this summer be it. There is no better time to tackle it. Add homemade pie to your bucket list. Your hard work and effort will be rewarded ten fold. Promise. 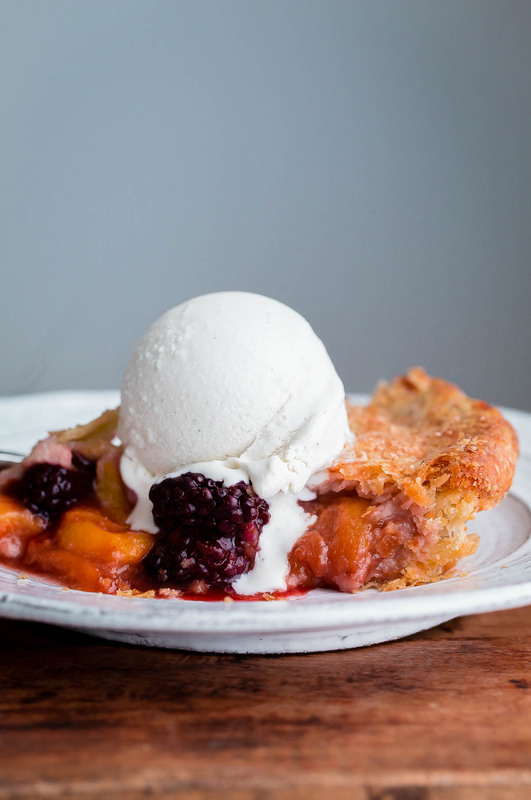 In fact, this blackberry peach pie might be the best dessert that’s come out of my kitchen all year! I can turn down dessert any day of the week, but homemade pie? Nope. It’s my kryptonite. I have a particular affinity towards peach pie, but any pie will do the trick. The addition of fresh blackberries give a touch of tartness in each bite and improves it for the better. 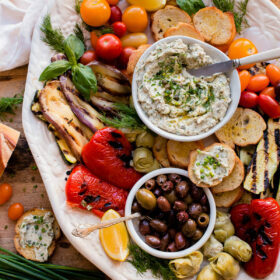 If this recipe sounds familiar, you’re right! I shared a similar blackberry peach pie almost five years ago to this day. Sadly, the pictures did not do it any justice. So, I turned back to the very same recipe, changed my technique a bit, added further instruction, made a few tweaks here and there, rewrote the recipe, and took new photos. The end result? 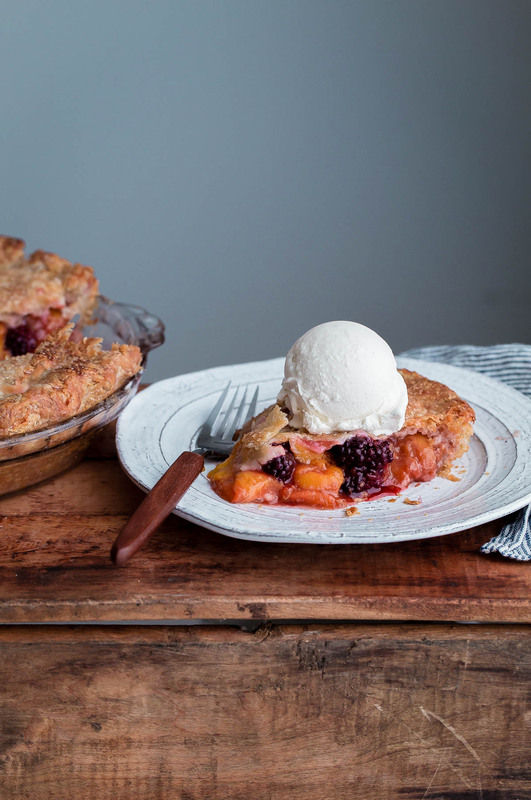 A new-and-improved blackberry peach pie recipe that you’ll want to make time and time again! Just check out that flaky pie crust. As is the case with most things in my life (particularly pastries), practice, discipline, and a basic understanding is key for great homemade pie. 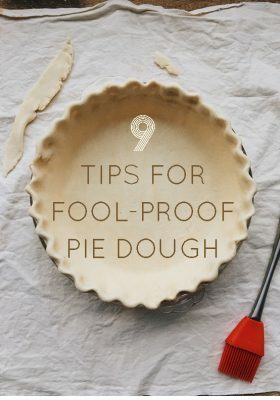 While you’re at it, re-read these tips for fool-proof pie dough. As a relatively impatient person, I’ve learned this lesson the hard way. Trust me. These lessons usually have come in the form of lackluster crust texture or shrunken pie crust. I repeat, homemade pie is not a spontaneous affair. Or rather, great homemade pie is not a spontaneous affair! If you’re in a rush and need to make dessert for a last-minute dinner party or gathering, pie is not the right choice. Pie requires planning, time, and patience. Lots of time. It’s mostly inactive time, but time all the same. Time for chilling, resting, and cooling. Some of the steps might seem repetitive and perhaps even a little excessive at times. But I promise, all of these steps are essential if you want to make a fabulously flaky homemade pie. These steps are even more essential if you wish to forgo shortening (my life rule) and want to make a flaky all-butter pie crust! The most important factor to keep in mind when making homemade pie is temperature. 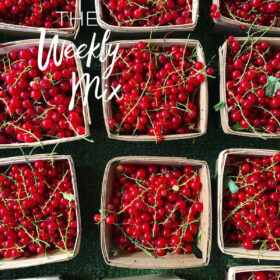 It is of the utmost importance that all of your ingredients, tools, and kitchen (if possible!) 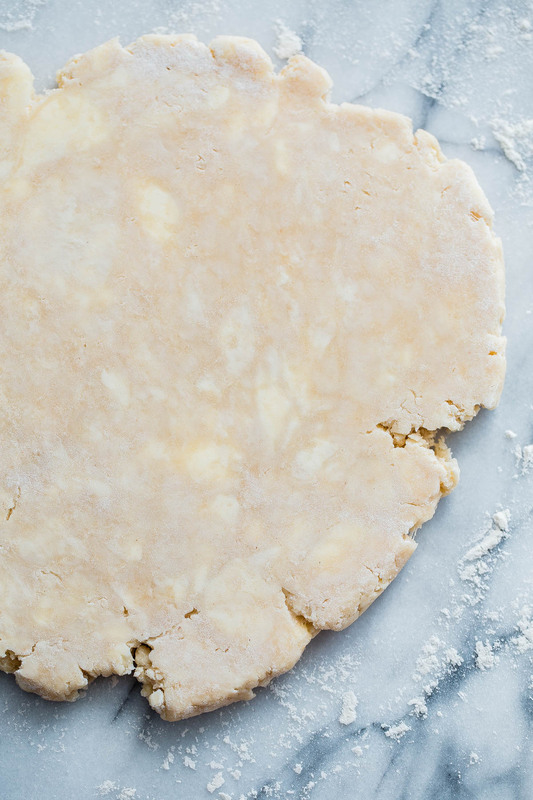 be as cold as possible before you start preparing homemade pie dough. Heat is your worst enemy. Cold butter, in particular, helps discourage gluten formation during mixing. It is essential that the butter stay chilled, in large and small pieces, in the final shaped pie as it hits the hot oven as this is what enables it to produce a flaky texture. Over the years, I’ve experimented and prepared pie dough in every method possible: by hand using a pastry cutter (takes the most time – therefore, be even more careful with the temperature of your ingredients), my old go-to method using the food processor, and most recently, a stand mixer and paddle attachment at the suggestion of Samin Nosrat’s excellent cookbook Salt, Fact, Acid, Heat. If you have one on hand, the stand mixer is my new favorite tool for preparing pie dough for several reasons: (1) the metal bowl can be chilled far longer and more efficiently than the plastic bowl of a food processor, (2) the paddle attachment provides more control at breaking up the butter into larger and smaller chunks than the sharp, fast pulsing action of a metal blade, (3) allows for more precision when slowly adding the water. 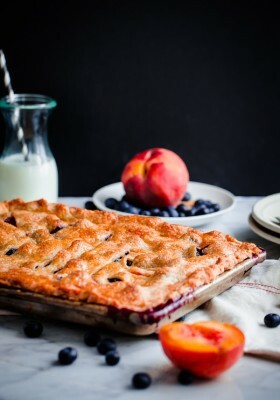 The filling for this blackberry peach pie is a combination of ripe, peeled yellow (or white) peaches, fresh blackberries, lemon juice, brown sugar, granulated sugar, a touch of cinnamon and nutmeg, and cornstarch. I’m not usually a huge fan of cornstarch, but it has an important role in this pie: thickening the filling just enough to prevent excessive weeping. The flavor is absolutely undetectable once baked, promise. PS. Don’t forget the vanilla ice cream! Place the flour, sugar, and salt in a stand mixer bowl. 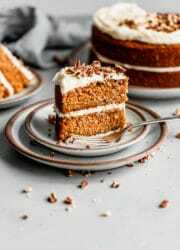 [If you do not have a stand mixer, you can also prepare the dough in a large food processor or by hand, with a pastry cutter – chill all of your tools before using.]. Transfer the stand mixer bowl and paddle attachment to the freezer (if your freezer is too small, you can use a large Ziploc bag or a small bowl). Place the butter in a separate small bowl. Chill the dry ingredients, tools, and butter for 20 minutes. Using the stand mixer, fitted with the chilled paddle attachment, mix the dry ingredients for 5 to 10 seconds over low speed. Over low speed, slowly add the butter, a few pieces at a time, until the butter has broken into a mixture of larger and smaller size pieces (similar to ‘broken walnut pieces’). Add the vinegar and slowly add the ice water (you will most likely need to use all of it or a touch more, depending on the humidity of your kitchen) until the dough just barely holds together. 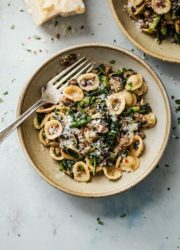 It will still look relatively dry and shaggy in the bowl, but if the dough can hold together (or almost hold together) when squeezed in the palm of your hand, it is ready. 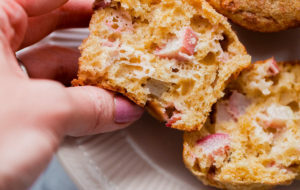 Transfer the dough mixture to a large gallon-size Ziploc bag (this helps lessen the warmth from your hands from transferring to the dough) and using the open ends and sides of the bag, press the dough together into a ball using the heels of your hand. Remove the pie dough from the bag and using a sharp knife, cut the ball in half. Wrap each half tightly in plastic wrap and flatten into a disc. Refrigerate for at least 2 hours or, ideally, overnight. Bring a large pot of water to a boil. Set aside a large ice bath near the stove. Using a paring knife, make a small, shallow ‘X’ incision on the bottom of each peach and carefully drop into the boiling water. Allow the peaches to blanch for roughly a minute (depending on the ripeness of your peaches) or until the skins begin to slightly peel away from the flesh. Using a skimmer or large spoon, transfer the peaches to the ice bath (this will prevent them from cooking any further) until cool enough to handle. Transfer to a paper towel lined plate and set aside. Meanwhile, remove one disc of pie dough from the fridge. 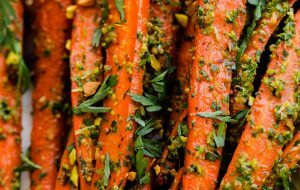 Allow it to sit at room temperature for 5 to 10 minutes or just soft enough to roll. 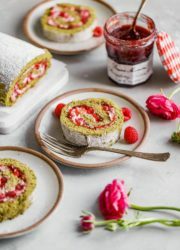 On a well-floured board (or marble slab) and rolling pin, roll the dough until it is about 1/8-inch thick or less and about 12-inches in diameter. Roll the dough around the rolling pin and transfer to a 9-inch pie pan (I prefer glass or heavy ceramic), pressing it into the edges of the pan without stretching the dough. Using a knife or kitchen scissors, trim any remaining overhang to one inch. 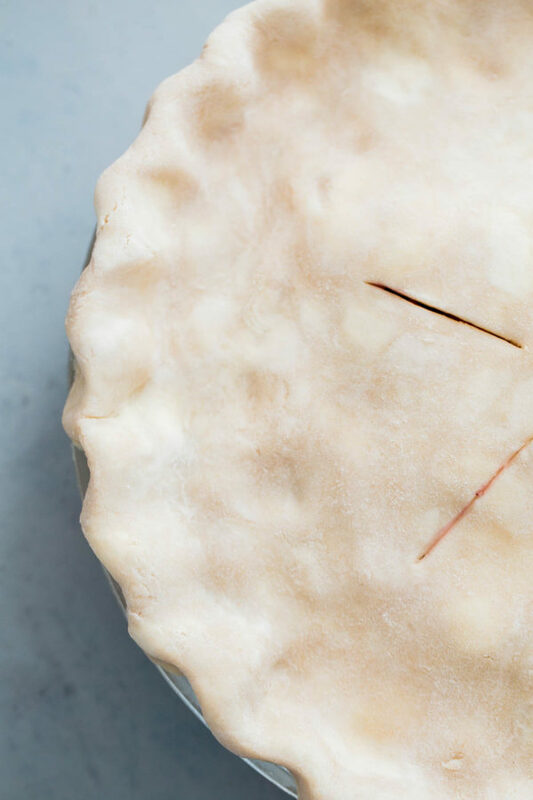 Brush off any excess flour with a pastry brush and place the pie pan in the freezer for 10 minutes (or cover with plastic wrap and refrigerate for up to 30 minutes). Remove the remaining pie dough disc from the fridge, unwrap, and roll until it is 1/8-inch thick or less, and 12-inches in diameter. Place between two sheets of plastic wrap or parchment paper and chill in the fridge while you prepare the pie filling. Prepare the filling: Using a paring knife, carefully peel the skin from the blanched peaches, remove the pits, and cut into 1/2-inch slices. Place the peach slices in a large mixing bowl and add the blackberries, brown sugar, granulated sugar, cornstarch, lemon juice, cinnamon, nutmeg, and salt. Toss gently to combine. Remove the pie pan with dough from the freezer and add the filling. Remove the rolled top crust pie dough from the refrigerator and place over the fruit filling, tucking the overhang of the top crust over and then under the bottom crust overhang border. 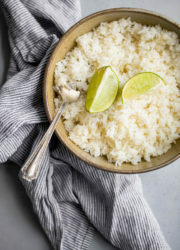 Using the knuckle of your index finger on one hand (on the inside edge of the crust) and the thumb and index finger of your other hand (on the outside edge), press and crimp the edges of the crust. Using a sharp paring knife, make four 2-inch slashes in the top of the crust, extending from the center out in a circle. Place the entire pie pan in the freezer to chill for 20 minutes (or alternatively, cover with plastic wrap and refrigerate for up to 1 hour). This will allow the pie dough to relax, the butter to chill, and helps prevent shrinking during baking. Place the pie pan on a parchment (or foil) lined baking sheet. brush the top crust with heavy cream, and sprinkle with demerara sugar. Bake at 425 (F) degrees for 15 minutes. Reduce the heat to 400 (F) degrees and bake for an additional 15 to 20 minutes, or until the pie is just beginning to turn golden. Reduce the heat to 350 (F) degrees and bake until golden brown, an additional 25 to 35 minutes. Allow the pie to cool on a wire rack for at least 2 hours before slicing. Serve at room temperature or slightly warm with vanilla ice cream or whipped cream. Pie dough recipe and method adapted very lightly from Salt Fat Acid Heat by Samin Nostrat. Filling inspired by Smitten Kitchen. It is essential that your pie dough ingredients start/stay as chilled as possible! This ensures minimal gluten development (tenderness) and allows the butter to remain cold as it hits the hot oven (producing flaky layers). Butter that starts to melt or soften will produce a tougher crust with very little flakiness. A small addition of white vinegar (aka. acid) helps discourage additional gluten formation as well. If you do not have white vinegar on hand, you can substitute it with apple cider vinegar or freshly squeezed lemon juice for a similar effect. It is not an essential ingredient by any means, but doesn’t hurt! Wow what a stunning pie! My friend keeps asking me to make her an apple-peach pie, I'll have to show her this! That pie looks delicious!! I very rarely make pie at home because I know I will eat the entire thing myself and regret it later on! I agree with you. I'm in the 100% butter group. Amanda — That sounds like a great combination! I definitely wanted to take advantage of all the great peaches I've been finding at farmer's markets lately–I actually got the "bruised" ones (which were incidentally in very good shape) and only paid $99 cents a pound for them. Let me know if you try it! Vanessa — I know what you mean, I'm lucky (or am I? haha) to have another human being around to consume some of it, so I don't eat it all. Go butter! This looks beautiful!!! I love pies and this combination is fantastic!! Rebecca — Thank you! Means a lot. Susan — It was a great combination and I'm glad I added them at the last minute–definitely cut the sweetness of the peaches, which was great. This looks amazing. I must find someone to make me a pie crust. Robin –Haha–it really isn't too bad, you just need to work quickly 🙂 Thank you so much for your sweet words and for visiting! I really appreciate it. Such a yummy recipe on fruits as I think. I got to know about the Blackberry Peach Pie as well. I was looking forward for such kind of info and got it from your post. Thanks for this nice allocation and carry on your updates for us….. 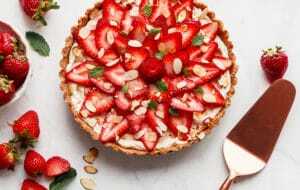 This recipe looks perfect and your pie is gorgeous!! I refuse to use shortening, too, but it’s totally not necessary- your crust looks lovely. Dying to try the blackberry peach combo now!! Oh gosh… blackberries are the bomb. That photo with the ice cream… mmmmm. 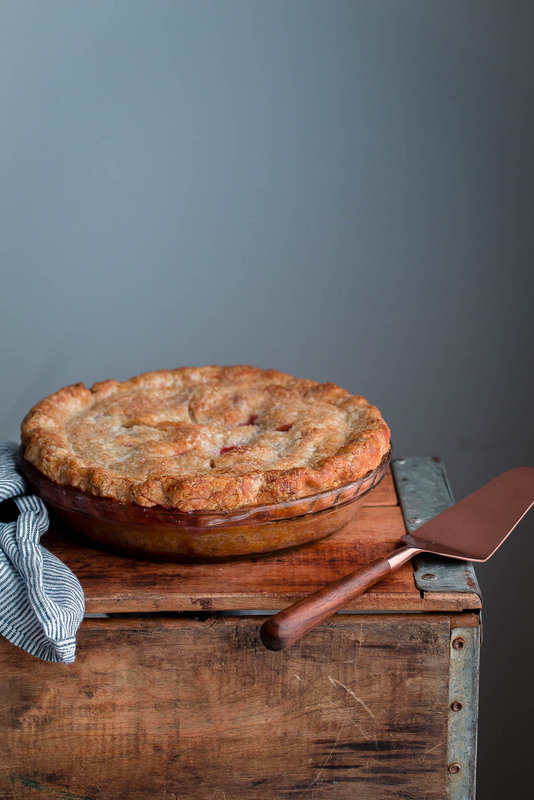 This pie looks heavenly and that crust … wow! It had taken me a good while to learn that to make a good crust you need to use cold butter 🙂 I haven’t tried making it in a mixer but it sounds like a great idea! Thank you so much Julia! It definitely took me a few years to feel comfortable with pie crust. When I started being more patient, my pies got better and better! 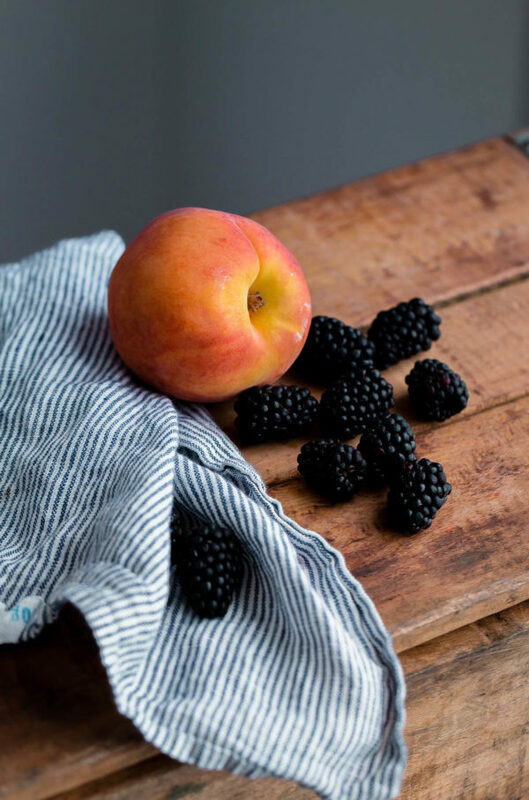 Blackberries and peaches is a favorite summer fruit combo for me. This pie is all kind of perfection in my eyes!! So pretty, Laura! Pie = everything! I absolutely agree and is the ultimate summer time dessert. I love the pairing up of blackberries and peaches. Looks divine! And yes, can’t go wrong with a little McConnell’s or Jeni’s ice cream on top. Well done! I assumed that the pie filling should be dotted with butter but the recipe did not say to do so. Perhaps the recipe should be updated. Also, I blind baked the bottom crust. I have the final freeze going right now – soon to bake the pie. I am not rating it because it isn’t baked yet. No, the pie filling does not need to be dotted with butter. 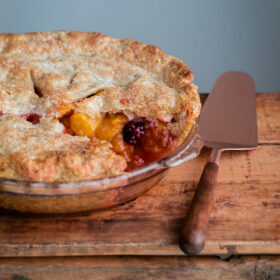 I’ve done this on occasion, but there is no real reason to do so (you can read this article, which tested this theory: https://www.cooksillustrated.com/features/8783-should-you-top-your-fruit-pie-fillings-with) and I’ve never been able to taste the difference between those that do versus those that don’t. You’re more than welcome to blind bake too – I don’t personally bother with non-custard fruit pies. Hope it turned out well for you! Would a lattice crust work with this recipe? Yes, it should. I would do a tighter lattice and make sure that you put the pie plate on a baking sheet (lined with foil perhaps) to make sure that if it bubbles at all, no juices will spill out onto the oven floor.